Rice protein is a very rich source of high quality protein and is considered one of the best quality vegetarian proteins available. Brown rice is used to make rice protein due to its naturally balanced amino acid profile (white rice is not). 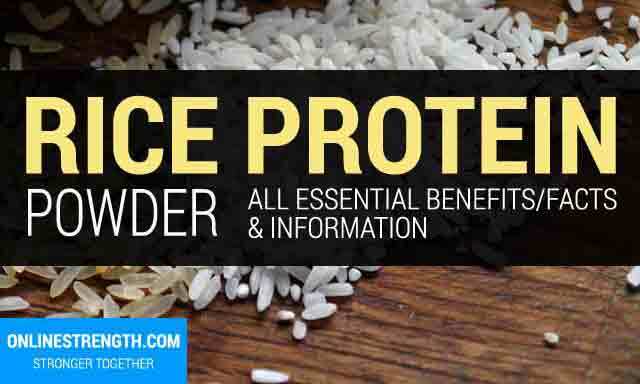 Rice protein is more often than not non-GMO, organic, and hypoallergenic. Best of all the digestibility is as equal or greater than whey protein and the amino acid profile is nearly as perfect. Easily digested and used by the body. High bio-availability. Contains no animal products, derivatives, or preservatives. No toxic solvents are used during the production and manufacturing processes unlike many whey protein powders. Made from organically sourced brown rice. non-GMO. Mixes very well in liquid. Contains a good source of vitamin B6 to assure adequate metabolism of nutrients and amino acids. High in vitamin B12 making it a good source of nutrients for vegans and vegetarians who lack this essential vitamin. Rice protein compares very favorably with whey protein in both digestibility and biological value. Superior to other plant based protein powders. 8/10 rice protein powder supplements ranked in this batch passed ingredient quality standards. All products were made from organic, non-gmo sourced brown rice ingredients. Onlinestrength’s ingredient value rankings are based on where the ingredients were sourced, with added artificial flavoring, fillers, and sweeteners being penalized in this rating. Brown rice protein powders are relativity clean with a majority of products having zero harmful ingredients. Research states that brown rice protein matches the effectiveness of whey protein for muscle growth, muscle mass, and exercise recovery. The two were compared head to head and both proteins showed promising results. There is good scientific evidence suggesting that rice protein, specifically brown rice protein, is effective at supporting muscle repair, gains, and overall weight management. Research also suggests that digestion of rice protein is easy on the body improving uptake of amino acids. Overall, rice protein powders had very little filler ingredients or artificial additives. When compared to the whey protein market, rice protein’s quality is far superior in every way. The amount of protein you need depends on your own individual daily protein goals and requirements. A daily target of 0.8g/kg bodyweight (0.36g/lb bodyweight) is a good goal if you’re just trying to function normally and live a healthy life without the bad side-effects of not having enough protein in your diet.